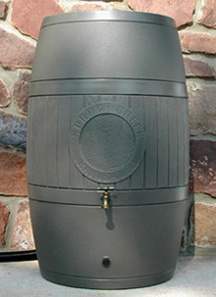 Ready for your gardening needs, this barrel replenishes its water supply every time it rains. You'll capture the fresh, untreated water otherwise lost to runoff. Nothing to watch, nothing to flip. The overflow located on the back of the barrel diverts excess rain to a garden, or distant runoff area. It's all one piece, with a closed top, so you won't need to worry about children or pets getting inside. Fully screened, It's mosquito proof too. The solid brass spigot is threaded so you can attach a garden hose directly to the barrel, or a second (bottom) access allows direct hose hookup while maintaining spigot availability. It arrives to your home fully assembled, easy to install, and delivered quickly via FedEx Ground. Built with only the best materials, It's a full 1/4 inch thick. Formed from 20 pounds of UV protected, durable plastic, it will stand up to the forces of nature for years to come. Your Rainsaver is guaranteed against any manufacturing flaws evident upon purchase or discovered after use. If there are any defects that are the result of manufacturing or shipping to your address, we will replace damaged components or the entire rainsaver. This complete product guarantee remains in effect for 180 days from the purchase of the barrel, and other components of the Rainsaver (not including the barrel body) will be guaranteed for 5 years against any flaw, damage, weather or wear. It is not necessary to take barrels inside during winter freezing, however full barrel freezing in northern climates will cause the greatest stress to the structure and longevity of the rain barrel. Although most rainsavers will experience no damage . . . even when completely filled and completely frozen . . . northern climate owners should partially drain the rain barrel to the upper spigot level during the months of Dec, Jan, & Feb. when extreme expansion of ice will occur.